Innovative Solutions for Second Life! 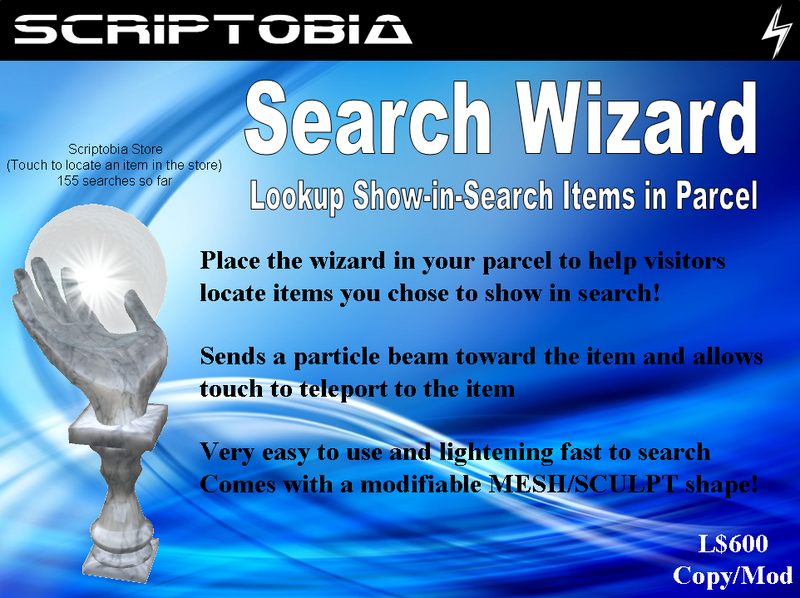 The Search Wizard can be placed in a parcel to allow visitors to easily locate and teleport to “show-in-search” items in the parcel. The look up is done using keywords that are included in the names and descriptions of these items. The search is lightening fast and non-laggy. The item is pointed to with a light beam (if close enough) and can be teleported to when the wizard is touched. All you have to do is rezz the wizard in your parcel and then add your items (signs, vendors…etc) in the search by checking their “include in search” flag. This will make the item’s name and description searchable by the wizard. Chances are that you already have those flags checked from before, which means your wizard can start to deliver value immediately. If you would like to see the wizard in action, please visit the Scriptobia stores at Nebo (link on the sidebar) and try searching for “robot” for example. Attractive shape. The wizard has an attractive mesh/sculpt shape with land impact of 6 only. The shape is modifiable to allow you to customize it to your parcel. The shape is also copiable to allow you to rezz it multiple times throughout your parcel. However, other shapes are also possible by moving the scripts to them. Configurable. Several parameters can be configured by owner over a menu (no messy notecards!) including: (i) floating label: name +description (ii) color of beam particles (iv) starting value of the counter of searches so far. Intuitive UI. The wizard has a very easy to use and intuitive user interface using floating text and menu to communicate with the user (i.e. no spam): (i) touch the wizard then type your search keyword in the chat, (ii) choose from items matching your keyword presented to you in a menu, and (iii) follow a particle beam and/or touch the wizard to teleport right to the item. Scalable. The wizard scripting is very light-weight and efficient; almost producing no added lag to your sim. The search operation is extremely fast (typically within a second). The search keywords are case insensitive and can be partial for ease of use. There is NO limit to how many items can be searchable in your parcel using the wizard. The wizard displays the number of searches performed so far in the floating text. Support and updates. Free automatic updates for life. Free professional support from the Scriptobia team. * The search includes all searchable items in the parcel regardless of whether they belong to owner or not. * The search keywords match against the words in the items’ names and descriptions (i.e. not by context aka google search). * The number of matches for every keyword are currently capped at 24 (due to SL limitations). * After any change to show-in-search/name/description/position properties of items, allow 24h for the wizard to pick up the changes. Scriptobia is committed to the highest standards of quality for its products. If you have a great (and doable) idea for enhancing this product that you like to see in a future revision, please reply to this blog below describing it or alternatively contact Maged Wise via email or IM.